And that has been the sentiment of almost every person we have encountered here ever since. All kinds of people are walking, riding bikes, and exercising early in the morning. Clouds of perfume remain even after women walk away. Couples walk hand-in-hand at sunset. Golf carts become the major mode of transportation on “campus” (wouldn’t YOU love to tool around in one of those things whenever you wanted?). People are relaxed and always friendly. It is a law to sit on the porch in the afternoon when the weather is nice. When you live here you get to say whatever you want…no filters! Every morning the humid Florida air leaves a heavy layer of dew on the grass. It’s like manna from the sky. I’m convinced that along with that dew a layer of love is left behind. When you get to the point in life that the days ahead are shorter than the days behind, nothing is more important than love. And it shows itself around this place in many and various ways. On those sunset evenings when romantic walks are taken around the grounds, hand clings to hand knowing that life is short and love is what matters. What have you learned from those who are older than you? See you in 25 years! It's great to see retirement communities flourish and provide all the essentials for a fantastic ambiance. 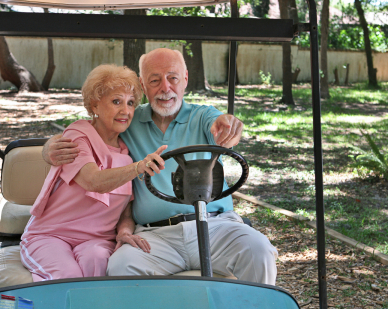 My parents are near retirement and maybe considering a retirement community later down the road so its good to read about places like the Haven.